Firebirds Wood Fired Grill is located in Charlotte (SouthPark) at Morrison near Barnes & Noble. We are an American Restaurant and Steakhouse known for our scratch kitchen, bold flavors and inviting atmosphere. Enjoy our signature menu items including hand-cut, aged steaks and fresh seafood or our specialty crafted cocktails and select wines. Join us for happy hour at the FIREBAR ® or on the patio for drink specials and bar bites. We offer top-notch service and upscale dining at a modest price. 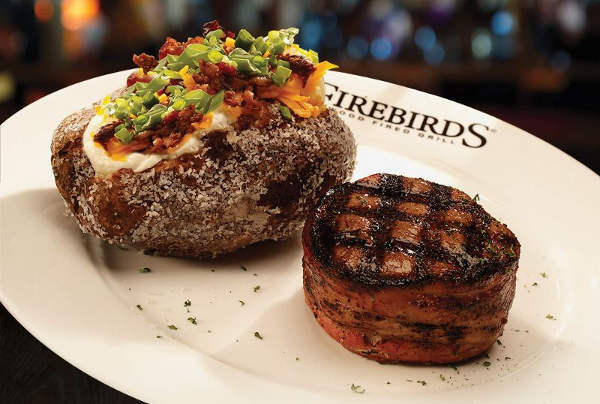 From business meetings to celebratory dinners and cocktail-style gatherings, Firebirds makes every event a success. Book our Private Dining Room today. Located at Morrison near Barnes & Noble.